I'm glued to the t.v. drooling over the beautiful fashion and thinking what it would be like to be able to get dressed up like this for just one glamorous night! Then I started thinking that fashion in a way is like decorating our homes! You have your own style, there are trends, accessories, the fit, the hit, the misses! So I thought I'd do a little short, fun post on turning Oscar fashion into home fashion! First there's Cate Blanchett nominated for Best Actress for Blue Jasmine. She's wearing an Armani dress made of capiz shells. And I think it's stunning! So classy and at the top of my list. 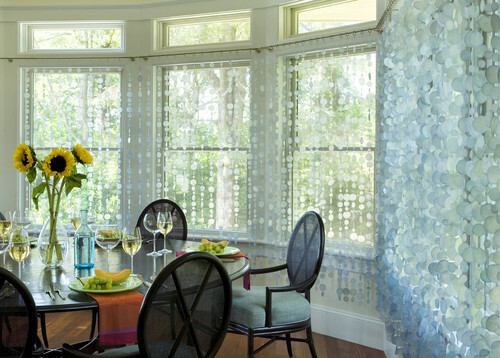 Capiz shell window treatments. 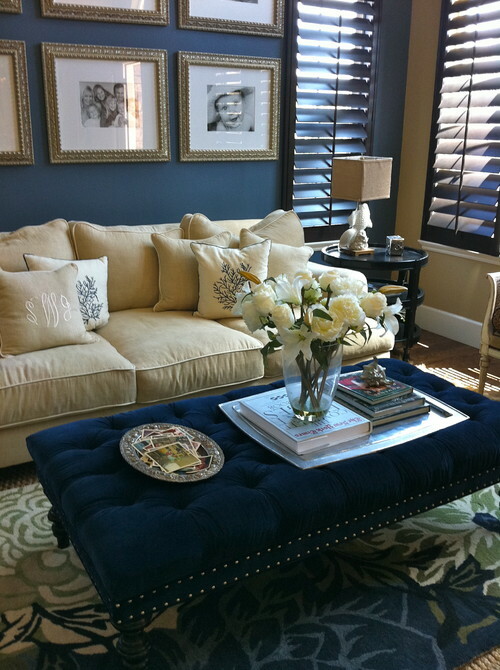 Great for a coastal, beachy feel! Unique for sure! Next is Jennifer Lawrence who's nominated for Best actress in a Supporting role for American Hustle. She's wearing this stunning "RED" Dior gown. Here is her gown if it were home fashion. 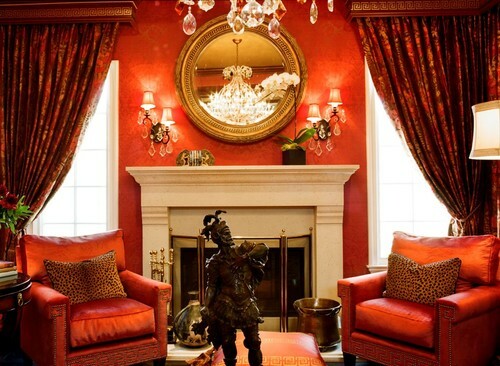 It's red, daring with gold accents and crystals! Anne Hathaway shown here walking the red carpet in her black and metallic gown is edgy and dazzling and could be described as "fierce!" This dining room would be the version of her gown. Black with metallic accents that is nothing short of drama! I'm loving all the different patterns...somehow they work! Amy Adams is nominated for Best Actress in American Hustle and is a classic beauty in this navy gown by Gucci. Also nominated for Best Actress for Gravity is Sandra Bullock also in navy. What a shame that they both wore the same color and pretty similar gowns. Remember when you were in school and someone had on the same outfit as you on the same day? Devastating!! I think someone's stylist might be in trouble! And here is the home version of classic beauty in Navy. This look is timeless and elegant.